A fireplace is a brick or metal structure used to hold a fire. Fireplaces are most often used for heating but they can also be used for cooking. 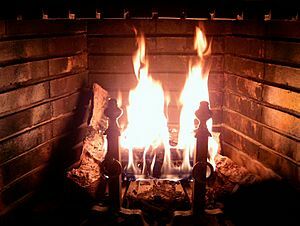 The part of the fireplace that holds the fire is called a firebox or a firepit. There is a chimney or flue above the firebox that lets the smoke from the fire go outside. Until the early 1900s, most homes had one or more fireplaces as a source of heat for the residents of the house. In the mid-1900s, gas, oil, and electric heaters became more common and fireplaces were used less often as a source of heat. In the late 1900s, fireplaces were less commonly built in new houses. Fireplace Facts for Kids. Kiddle Encyclopedia.